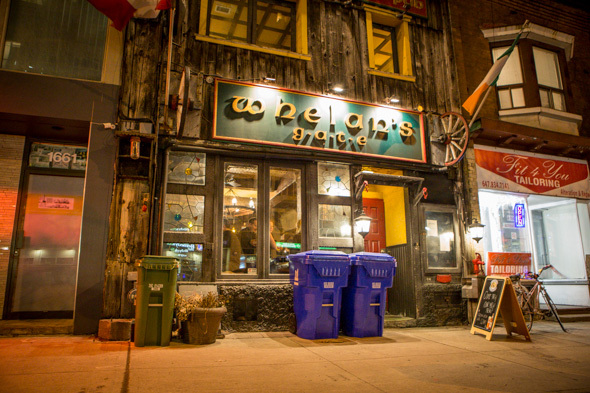 Whelan's Gate has been the local Irish pub on Bloor just east of High Park since 1992. Throughout the years, it's changed owners five or six times, and at the start of this year it reopened again under new management/ownership. This time around, the newest owners are Stephanie Brown and Stephen Auty, who met when they both used to work at the Storys Building where Auty was the GM. The two decided to go into the bar-owning biz together when Brown came across this opportunity. They've tinkered with the two-floor, 110-capacity interior (plus 30 when the outdoor back patio is open), keeping the rustic barnwood elements intact while improving the bars, bathrooms and lighting. 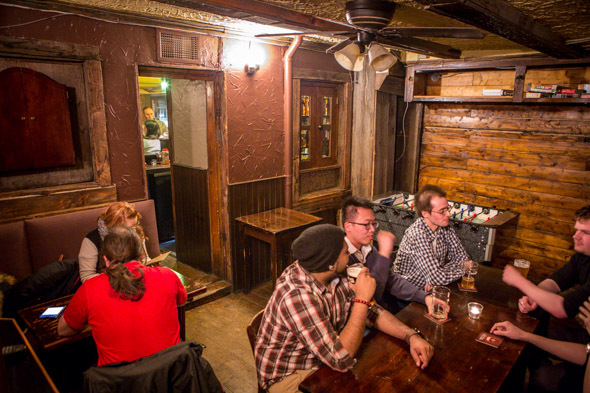 The first floor feels cozy and log-cabin-like while the upper floor is bigger, with a back room that has a foosball table and board games leading out to a spacious back patio. 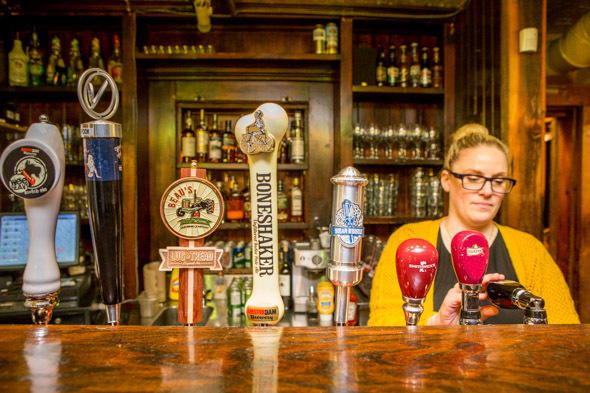 Eight draft beers ($8/pint, tax included for all alcohol) cover three Irish standards (Guinness, Kilkenny, Smithwick's) and five local microbrews (Beau's, Boneshaker, Nickel Brook, Steam Whistle, plus one monthly rotating tap). Domestic bottles go for $5 and tall cans $7. A cocktail list developed by Auty (who also worked on the drinks menu at Bestellen), includes interesting twists on classics. 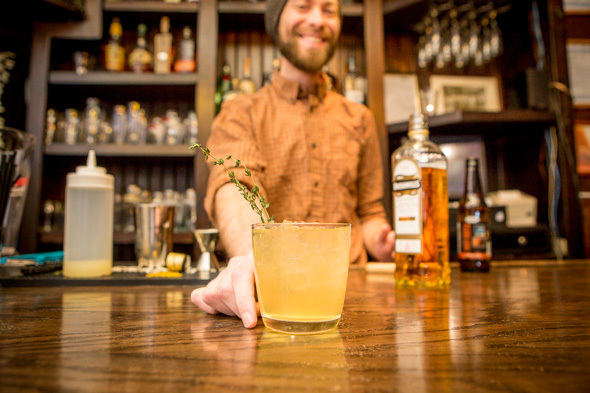 The Irish Mule ($12) is a play on the Moscow Mule, replacing vodka with Irish whisky (Bushmills) instead, plus ginger beer, lime, thyme-infused simple syrup and a sprig of thyme for garnish. 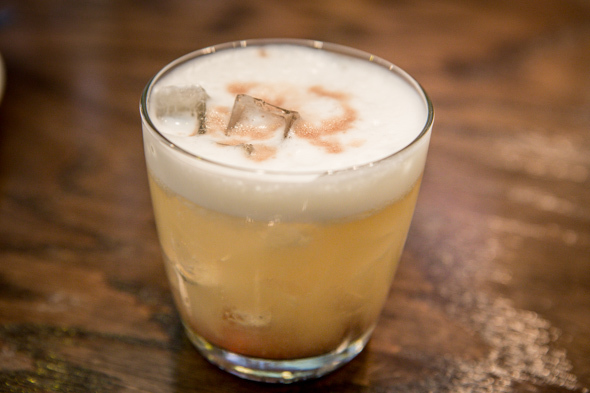 The Bourbon Sour ($12) is made with the addition of a Cherry Heering float at the end, which adds some depth of flavour to the drink. Helming the kitchen is chef Mike Tan (Huntsman Tavern, The Saint, Oddseoul), who's created a menu of Irish-inspired comfort food, where everything is made in house (except the ketchup) - from the sausages for the bangers and colcannon ($16) down to the hot sauce. To start, the hummus salad ($10) is a colourful, deconstructed version of the Middle Eastern dip. 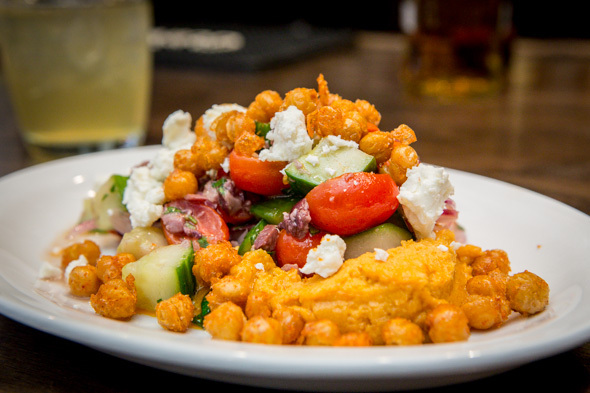 Crispy fried chickpeas taste like smoked paprika and cayenne, and are mixed in with a Greek salad of tomatoes, cucumbers, olives, onions and feta. It's a dish with interesting textures and flavours, if not a little oversalted. Pork belly bites with fried polenta ($15) are definitely a highlight. 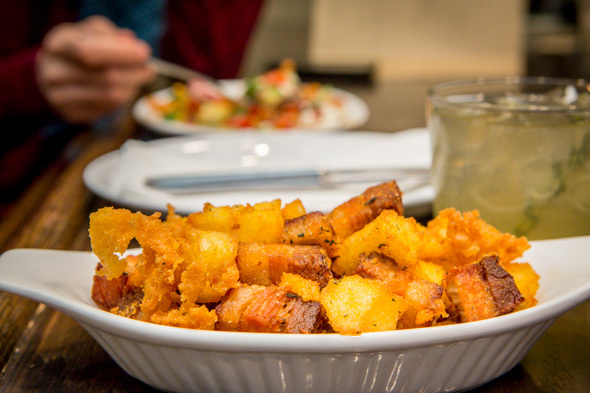 Lightly cured, braised and then fried pieces of pork belly are mixed in with deep-fried chunks of polenta seasoned with black pepper and lemon-fennel. It's a satisfying and brilliant mix of salt and fat that makes this the perfect bar snack. The O'Tanigan Burger ($15) is a playful way to Irish-ize Tan's clearly non-Irish name, and is a behemoth of double-stacked patties made from house-ground chuck cooked to medium, American cheese, griddled onions, iceberg lettuce, dill pickles and a horseradish mayo between two buns. It's a huge, flavourful, sloppy mess to eat and comes with a side of crispy thin-cut fries. Some new regulars come in, and one tells me she dreams about the burger while another hasn't tried anything else on the menu because he keeps coming back to order the same thing. It's a meat-heavy menu, but Tan will make veggie-friendly versions of dishes if requested. 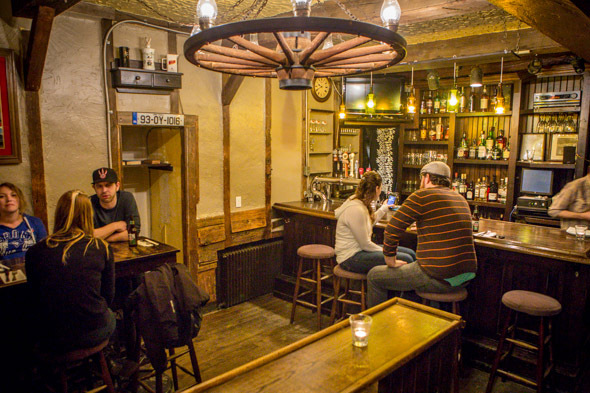 The staff is super friendly and seem to enjoy what they're doing, which is exactly what you want out of your local neighbourhood gastropub. Live Celtic music on Tuesdays, buck-a-shuck Wednesdays and half-price glasses of wine on Thursdays only sweeten the deal.